June 2012 | WITNESS and our partners in Rio de Janeiro, Comitê Popular Rio da Copa e Olimpíadas, launched the first video in a new portrait series, O Legado Somos Nós (We Are the Legacy). The series will highlight emblematic personal stories of forced evictions in Rio, counter the municipal government’s official narrative on the issue, and reinforce our partners’ advocacy demands at the local/national levels in Brazil. The video profiles a woman named Elisângela who recounts the day she received a call from her 17-year old daughter telling her that demolition crews were at her door and ready to tear down her home. Despite her attempts to negotiate, authorities demolished the home she and her family had resided in for years. 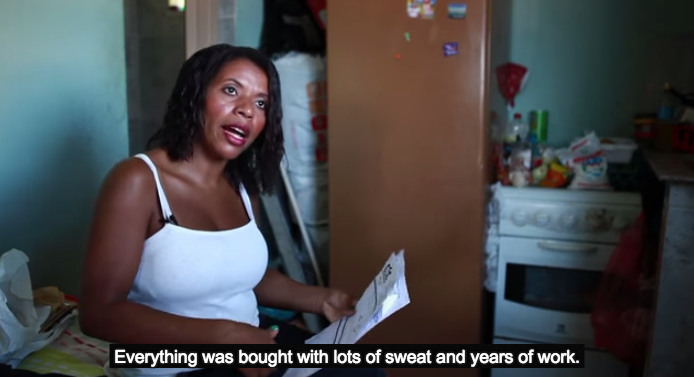 Watch Elisângela’s story below, click “CC” to watch with English subtitles. Over and over again, we hear local authorities in Rio discredit reports of forced evictions and deny any wrongdoing. But over and over again, we meet people like Elisângela, forcefully removed from their homes without prior notice, compensation, or adequate resettlement. It just doesn’t add up, and we’re still waiting for answers to the questions we highlighted in March after the New York Times covered the issue on its front page. Read more about this video and the campaign on the blog.